As a show, BoJack Horseman is getting better and better with each episode, and a major reason for that is that it’s taking the time to devote those episodes to its supporting cast. While BoJack’s name is in the title, and his memoirs are the ostensible arc for the season, he’s surrounded by a lot of other interesting characters (played by talented actors). Smartly, the writers are giving each of them their time in the spotlight. “Zoes And Zeldas” allowed us to see that Todd was capable of more than getting high on BoJack’s couch. “Live Fast, Diane Nguyen” proved that Diane’s put-together facade was covering up a lot of insecurities and issues with her upbringing. “Our A-Story Is A ‘D’-Story” let Mr. Peanutbutter show more than raw enthusiasm, displaying both cunning and sincerity when it came to his girlfriend. “Say Anything” completes the show’s initial exploration of the main cast, and they’ve saved the best for last. If Princess Carolyn’s been the least developed of the main cast to this point, this episode establishes her as potentially its best character. BoJack Horseman’s displayed two strengths in its early episodes, its unique twist on show business and the emotional scars on its cast members, and “Say Anything” gets top mileage out of both. It’s a episode that lets us see how the other half lives, and—surprise, surprise—the other half has a hard time of it even when BoJack isn’t around. There’s no hint this is the path we’re going down in the cold open, as we open on a typical BoJack Horseman situation. BoJack, unable to deal with Diane’s engagement to Mr. Peanutbutter, went on a bender lasting two weeks and ended it crashed in front of Princess Carolyn’s apartment. Episode writer Joe Lawson packs some terrific jokes into a limited timeframe here: BoJack’s brief and tragic friendship with “John Stamos” (and Princess Carolyn’s Rashomon clarifications) her introduction of an urban German bourbon, and Todd being the worst designated driver in history. It’s proof that the series is growing more comfortable with its wordplay and references, ratcheting up the pace to rapid-fire. Here’s where events change up, as in a normal episode you’d expect to follow BoJack back to his house and see how he’d find a way to screw up this new opportunity. Instead, we follow Princess Carolyn to her breakfast meeting with legendary producer Lenny Turtletaub (J.K. Simmons) and stay there. It’s a decision that moves us past her incidental actions like adding Andrew Garfield to her client roster or making some cash off of Boreanaz House. “Say Anything” proves her competence and drive in juggling all the various balls that it takes to get a film into production, from glad-handing producers to reassuring her stars to fending off the barbs/poaching attempts of rival agents. What it also proves is that it’s hard to be Princess Carolyn. She says in annoyance that BoJack takes up 80 percent of her time, but the other 20 percent isn’t spent any easier. A merger at her agency Vim puts her into contact with her arch-rival Vanessa Gekko, mentioned back in “Prickly-Muffin” and now seen for the first time. (Not an animal despite her name and Princess Carolyn’s invectives, in a nice bit of misdirection by the BoJack creative team.) The first part of this season leaned on the “show” part of “show business,” and now we’re getting the other half of the equation. Amy Sedaris gets to show a lot more depth in her scenes this week, shifting from malicious to ingratiating in seconds, and also getting to show us a Princess Carolyn growing increasingly desperate as those juggled balls start to get dropped or snatched away. Not that following Princess Carolyn around means that we’re free of BoJack, because she’s nowhere near free of him. Her encouragement was enough of a lifeline out of his bender that he’s decided she’s the only woman for him, a realization that a series of increasingly rough flashbacks proves he’s come to on more than one occasion. With Guten Bourbon’s ad campaign handed over to Todd—the power and the spiked fake bourbon immediately going to the latter’s head, in an runner that adds even more chaos to Princess Carolyn’s day and some humor to an increasingly tense episode—BoJack is free to make her bad day even worse. Which he does in the most hilariously asinine way, dropping off a cardboard cutout that spews quotes from Jerry Maguire every time someone walks past it. Beyond giving us a bigger look at Princess Carolyn’s daily life, “Say Anything” also tries to answer an important question about the character: why someone as ambitious and talented as she clearly is shackle herself to a horse who’s neither of those things. As expected, the answer is complicated. Some of it’s basic loyalty to a client, some of it’s her ability to convince herself of anything, and some of it’s the surprising fact that for all his hassles and complications there’s something easy about BoJack. He’s acerbic and rough, but he’s capable of being sweet when he wants to be; and annoying as the cardboard cutout is, it once again reflects he can pay attention when it matters. With his overtures coming at Princess Carolyn’s lowest point—losing Eva Braun and Cate Blanchett to Vanessa—why would she turn down what seems like a genuinely sincere overture? It is sincere, but it’s also tenuous, to the point that one phone call—Herb Kazzaz returning BoJack’s message to throw down vitriol and an ultimatum—smashes it apart. From the beginning of the series, there’s been a particular spark to the interactions between Sedaris and Will Arnett, a lived-in crackle that goes beyond their basic conversations. Here, the usual frustration and flirtation gives way to a world-weariness, the knowledge that both of them wanted to believe that this time this would happen, and the unspoken feeling it’s not the first time this has happened. Lawson’s script also doubles down on the bad vibes by making BoJack unequivocally the bad guy in this scenario, snuffing any of the positive impressions BoJack’s actions might have engendered when he dives so deep into his self-pity he can’t even offer Princess Carolyn a ride home. 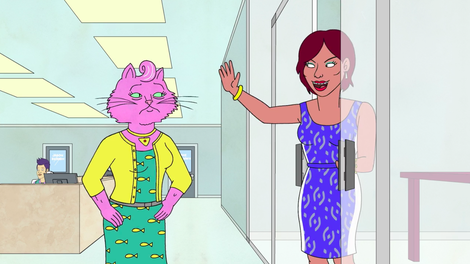 But much as she landed on all fours when BoJack shoved her out of his car in the pilot, Princess Carolyn does the same thing, in the best detail about her this episode: she’s damn good at what she does. BoJack’s knowledge of her personal habits pairs with Vanessa’s disregard for having that knowledge about Cate Blanchett, and she pulls off a beautiful double cross by hooking Cameron Crowe for a new project. (Who’s actually a raven. Common mistake.) And thanks to securing the rights for the ‘D’-theft caper—a move we saw in the previous episode, further proving her foresight—she’s pulled off her impossible promise to her boss. BoJack’s got a job, and her job is safe. But BoJack doesn’t seem happy about the victory for some unsaid reason, and even if he wasn’t there’s something hollow about her victory. The prevailing feeling over the last few episodes of BoJack Horseman is that despite its sense of humor—one that’s still fully on display this week between Todd’s histrionics and BoJack’s chair-spinning—is that the dramatic side is where the show’s strengths are. Princess Carolyn poured a lot of effort into her work, and a lot of hope into her relationship with BoJack, and all she’s got to show for it is her phone being the only entity to wish her a happy fortieth birthday. Even without Lyla Foy’s “Impossible” taking us out—the first time the closing theme is replaced—the action ends on a deeply melancholy moment. All the episodes to date have ended on darkly comic punchlines or moments of foreshadowing. This? There’s nothing funny about this. At the start of the episode, when BoJack asks Princess Carolyn if there’s any truth to her tough love pep talk, she responds with a matter-of-fact statement: “BoJack, I’m an agent. I believe whatever I say.” In that cold open context it’s a line of dark comedy, and by the end of the episode it’s only dark, the feeling that the lies she tells her clients are secondary to the lies she tells herself. “Say Anything” may not give Princess Carolyn what she’s looking for, but it gives BoJack Horseman a push to another level of storytelling. The biggest disappointment of “Say Anything” is the way it sweeps the blackmail plot out of the way. BoJack couldn’t be bothered to care about it for three episodes straight, and Vanessa shuts it down with some legal statutes and the threat of framing the photographers for the murder of Tupac. The writers were going for something when they introduced it, but as an ongoing arc it never achieved its true potential. Todd’s rant about bourbon is 100 percent correct, as the whiskey cannot by law be produced outside of the United States and still called bourbon. I’d also argue that it can’t be produced outside of Kentucky and called bourbon, but that’s a personal issue more than a legal one. “Suffragette City: A Coming of Age Story About Rock Music, Being a Teenager in the ‘80s and Buying Zoos?! How have I not heard of this book?! Raphael Bob-Waksberg, in an interview with Entertainment Tonight, said that he regards “Say Anything” as a turning point for the show and the place where they could start to throw BoJack under the bus as a terrible person. The aforementioned cardboard cutout came as a response to a Netflix note that a show called BoJack Horseman should have BoJack Horseman in it as much as possible, so they found a loophole for it. BoJack’s constant repetition about how all the terrible things that clarify his relationship with Princess Carolyn as the “best thing that ever happened” makes the title of the episode where said relationship ends all the more powerful. This is the first episode of BoJack Horseman written by Joe Lawson, who’s got an impressive array of credits on the series to date: the season three premiere “Start Spreading the News,” structural experiments like “After The Party” and “Stop The Presses,” and emotional gut-punches like “Escape From L.A.” “Say Anything” is proof he mastered the show’s absurdity and emotional strength early on. 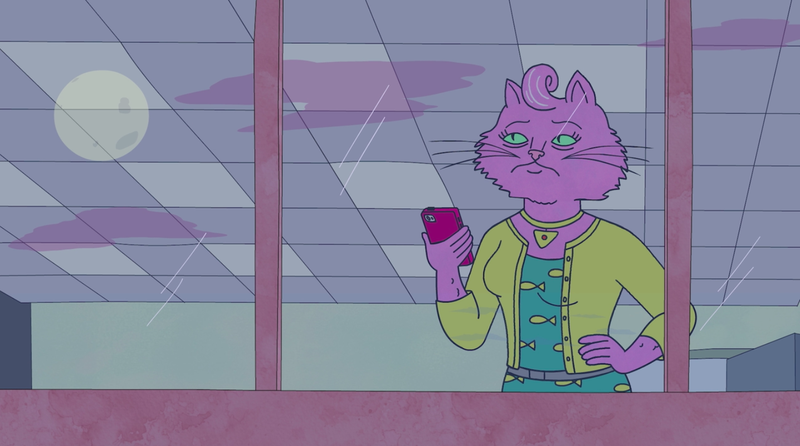 Vanessa Gekko will return in dream form in “The Shot” and real-life form in “Old Acquaintance,” and in both cases be determined to make trouble for Princess Carolyn. Tomorrow: We look through “The Telescope,” and while BoJack seems small and weak when viewed from one end of the lens, at the other end we can see BoJack Horseman reaching its full potential.